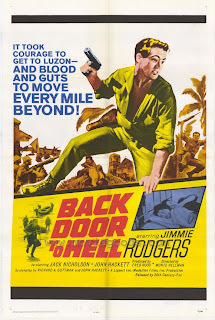 Under the watchful eye of Lippert’s producer Fred Roos, Hellman shot both films starting with Back Door To Hell with, predictably, very little money, a back-breaking schedule and the inherent chaos of the Philippines to contend with. 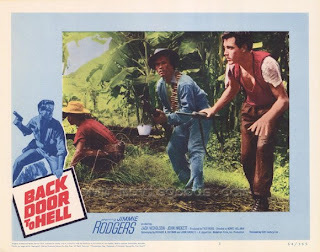 Not surprisingly Hellman fell deathly ill with an unnamed tropical malady and was unable to supervise the first cut of Back Door… while almost dying daily on the set of Flight To Fury. As a result, Hellman has little to say about his low-rent Philippines adventures, but it does explain the grit, grime and purposeful nihilism in every frame. Add Nicholson’s memorable dialogue and a growing awareness of his strengths as an actor, and you have two perfect low-budget, almost no-budget, micro-masterpieces. 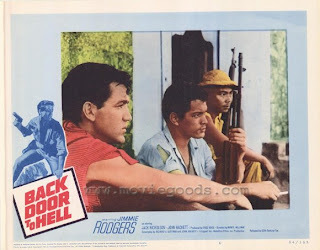 Back Door To Hell is a taut World War 2 drama with a similar look to the other b&w war films made in the Philippines at the time by Eddie Romero and American B actor George Montgomery. Unlike those films, however, there’s no rousing gung-ho speeches here; it's made clear from the start these men, much like the director himself and Francis Ford Coppola after him, are slowly falling to pieces in the Filipino jungle. In Hellman’s case, the Apocalypse starts RIGHT now. Jersey: "We're all gonna die anyway - tomorrow, next week, 30 years from now. Did that little thought ever penetrate your thick skull?" 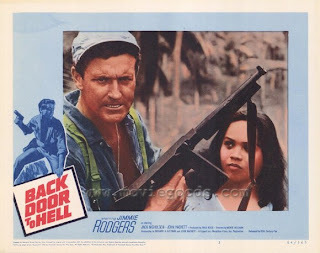 The American guerrillas team up with Paco, an embittered Filipino resistance fighter whose survival insticts lead him to mistrust both sides; tired of sacrificing his men for his liberators, he's introduced as the man who has tortured Rodgers' contact to death, just in case... 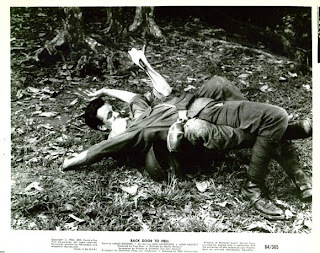 In fact, torture is Paco’s preferred modus operandi, as evidenced by his treatment of the captured Japanese Captain played by Joe Sison (a well-worn Filipino goon, also in Eddie Romero and George Montgomery exports). "Interrogating a prisoner is like cooking a goose..." says Paco, almost salivating at the prospect. 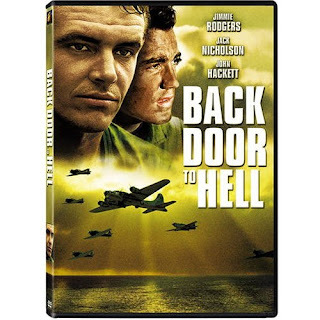 Stripped of most of its military hardware and pyrotechnics, the film is more a claustrophobic deconstruction of a war film, an exercise in rapid-fire montage filled with simple, cost-effective visuals and quiet flourishes such as an incredible 360 degree pan from the Japanese Captain's point of view, and a modest character study of men pushed to the brink. 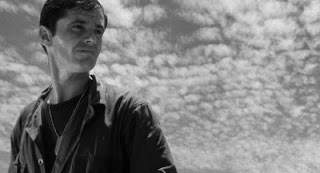 The tacked-on newsreel footage towards the end showing the liberation of Luzon, inserted against Hellman’s wishes by the distributor to make the film more “war-like”, is gratuitous and unwelcome. 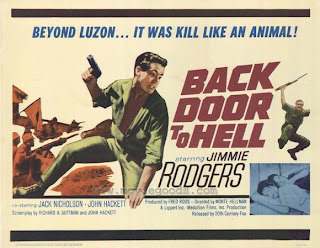 Surprisingly good in his role as Lieutenant Craig is Jimmie Rodgers, the easygoing folk-rock singer (and Back Door…’s co-financier) who had a mildly successful career until a drunken incident with a policeman in 1967 left him with a fractured skull and a legacy of brain-related complications. Hellman himself would eventually recover from his harrowing Philippines experiences and collaborate with Nicholson once again on two westerns, Ride In The Whirlwind and The Shooting, which can only be described as existential". Frankly, the same term can be applied here. 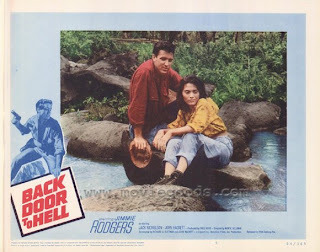 Monty Hellman's Back Door to Hell (1964), about a group of soldiers making a secret landing on Bicolano soil to prepare for MacArthur's coming gives one a chance to compare the filmmaker's camerawork against Filipino masters like Gerardo de Leon when using the same or at least similar landscape; the differences are--well, I don't know. I'm not aware of exact numbers--Hellman's budget couldn't possibly be much larger than that of a standard Hollywood feature's-- but the crispness of sound, smoothness of camera movement and clarity of footage go way beyond even the most expensive all-Filipino production; one wonders if perhaps Hellman simply brought better equipment with him. Both have their distinctive styles, with Hellman favoring low-angled cameras and carefully interlocking shots that show the soldiers' stealthy progress against the Japanese; de Leon often works with grand gestures, with tiny figures running up some tilted landscape, often as if they were working their way up a Sisyphean incline. When the action breaks out, both use crisp, precise editing, and standard-issue music to ratchet up (however imperfectly) the tension. 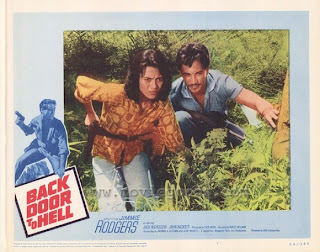 Hellman's characters talk in a hardboiled language, however, while de Leon betrays a less updated sensibility by having his characters speak florid dialogue in a stagy, often theatrical manner (though he does have a tendency to position his people the way a Japanese director might in a drama scene--both facing the camera, one standing in a far corner, the other up close and looming). A fascinating gem, an efficient genre piece--one that deals, however briefly, with the issue of death and killing and a man's evolving response to them--and easily the best of the titles mentioned here. 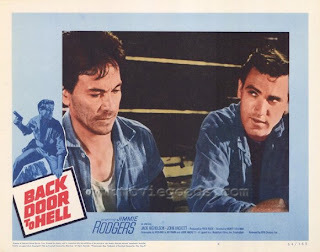 Renown cult director Monte Hellman ("Flight to Fury"/"The Shooting"/"Two Lane Blacktop"), in his first directing effort, does wonders with this wartime adventure story considering he was operating on a shoestring budget and didn't have the bread to shoot extensive battle scenes. The black-and-white film is based on a story by Richard A. Guttman and scripted by Guttman and John Hacket (he also has a leading role as a sergeant called Jersey). It's set in 1944 in Luzon, Philippines, just prior to the American advance to take back the island from the Japanese. 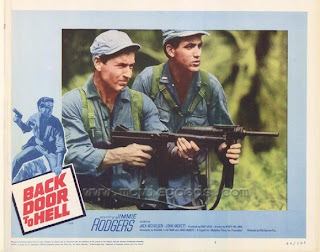 A three-man American commando team from an Intelligence unit led by Lieutenant Craig (Jimmie Rodgers, noted country singer, he financially backed the film along with executive producer Lippert and Fox studio), a hardnosed sergeant called Jersey and a young philosophical wisecracking radioman called Burnett (Jack Nicholson). The three get to their rendezvous point with Filipino guerrilla fighters after losing some men in a Japanese ambush. Instead of being met by Miguel, they are met by brash new leader Paco (Conrad Maga). He says he killed Miguel because you can't trust people during the occupation. The Americans, unsure of the new leader, have no choice but to ask Paco to assist them in their important reconnaissance mission to determine the strength and position of the Japanese forces. The Japanese under the command of an evil captain (Joe Sison), threaten to kill the village children if the guerrillas don't turn over the Americans. This prompts the Americans to team up with the guerrillas and take over the Japanese in a surprise raid. The soldiers then meet on the road a Filipino bandit who trades info about the Japanese positions for the American's radio. But the bandits are not willing to wait around as the Americans check out the info before relaying it, and steal the radio. This prompts the Americans to sneak into a Japanese-held village and have Burnett send the message on a Japanese shortwave radio. When spotted by the Japanese a shootout results, with heavy losses for the Americans and guerrilla fighters. The film's main strength is the lively banter among the American soldiers. Nicholson ribs the cynical Hackett with the line "You're the kinda guy who'd call Mahatma Gandhi a rabble-rouser." In another exchange Hackett says to Nicholson in the battlefield "We're all gonna die anyway - tomorrow, next week, 30 years from now. Did that little thought ever penetrate your thick skull?" Nicholson replies "Yeah, once when I was a boy, but naturally I dismissed it as being too outrageous." The small film had that kind of big personality. This is my favorite JACK NICHOLSON movie out of all he has made....that I have bothered to see or watch.....the movie also has Jimmy Rodgers, western singer of sorts but NOT THE OLD BLUE YOLDELER! The reviews are interesting for the most part but I suggest you not let these influence your watching ability and intellgence...thanks.